Numbers, numbers, numbers. ComScore is back with a few more of them, this time covering the mobile market during a three-month average period ending in October. The results aren’t going to shock you: Android not only continues to dominate the market, it’s on the up-and-up. 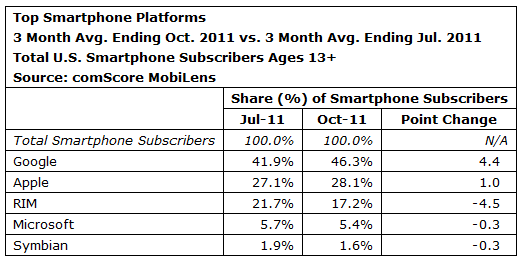 Out of 90 million smartphone users in the US, Android held strong at 463 percent (up from 41.9 between May and July). 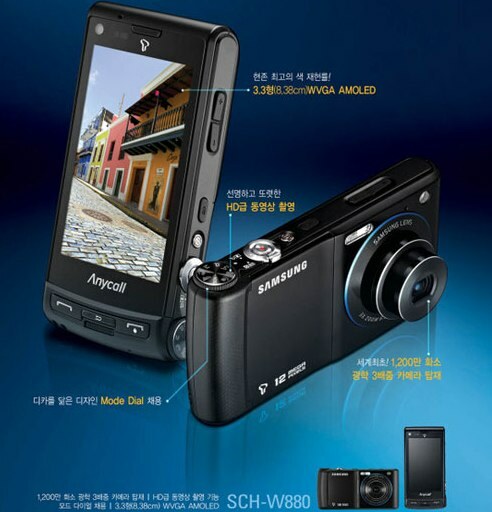 Apple bumped up a full percentage point, while RIM’s BlackBerry OS took the largest fall from 21.7 to 17.2 percent. What about Windows Phone? Microsoft’s mobile OS fell slightly from 5.7 to 5.4. Moving from mobile platforms to OEMs, Samsung was still the top vendor at 25.5 percent, though it didn’t grow or diminish that number. Rounding out the top five was LG (20.6 percent), Motorola (13.6), Apple (10.8) and RIM (6.6). If more numbers are what you crave, check out the full press release — as well as another chart — after the break. ComScore: Android continues to boom, RIM and Microsoft decline originally appeared on Engadget on Mon, 05 Dec 2011 15:22:00 EDT. Please see our terms for use of feeds.